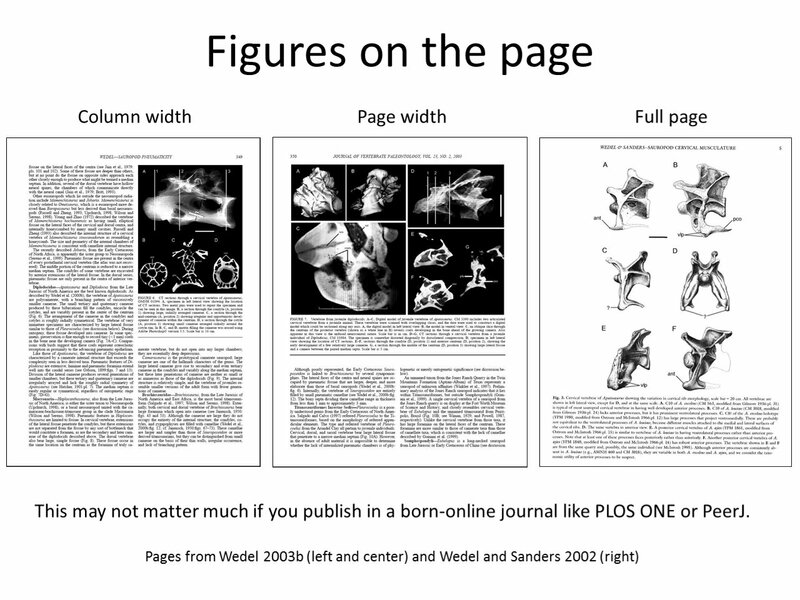 On that last slide, I also talked about two further elaborations: figures that take up the entire page, with the caption on a separate (usually facing) page, and side title figures, which are wider than tall and get turned on their sides to better use the space on the page. And I just noticed that the first slide in this group has the word ‘without’ duplicated. Jeez, what a maroon. I’ll try to remember to fix that before I post the whole slide set at the end of this exercise. Wedel, M.J. 2003b. 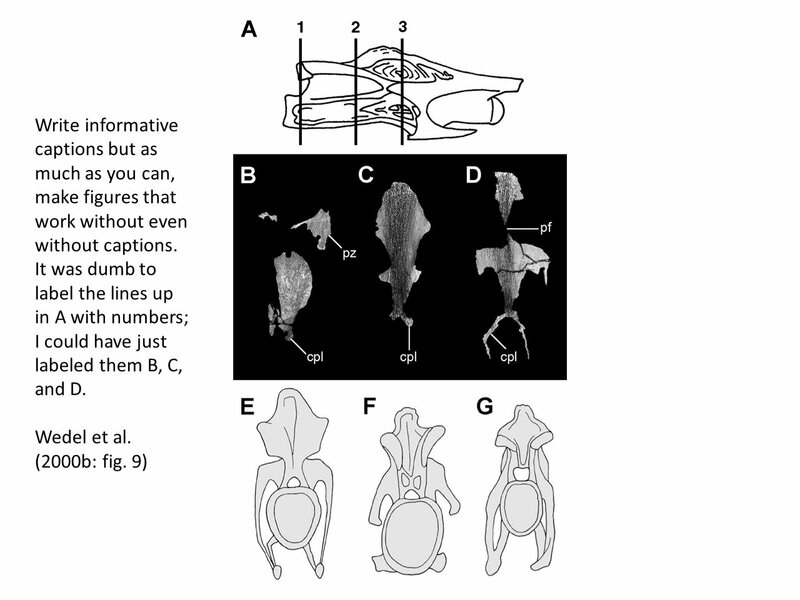 The evolution of vertebral pneumaticity in sauropod dinosaurs. 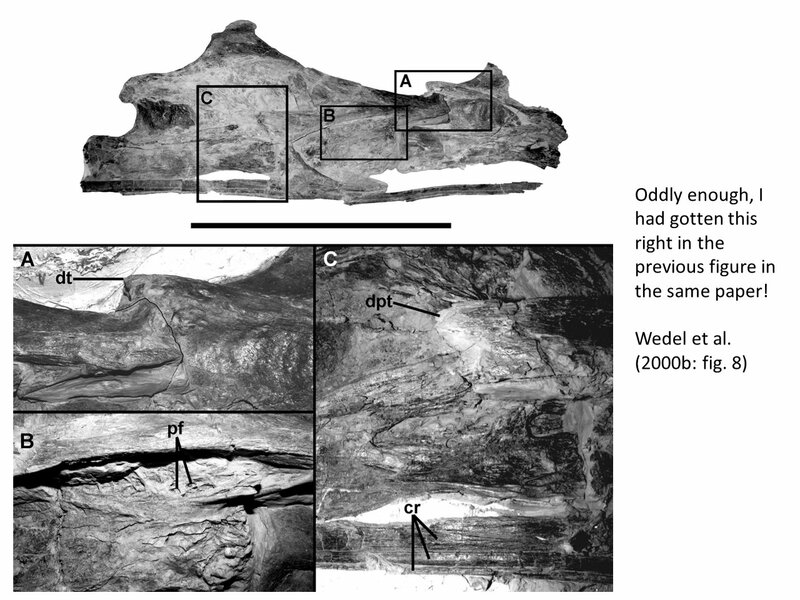 Journal of Vertebrate Paleontology 23:344-357. Wedel, Mathew J., Richard L. Cifelli and R. Kent Sanders. 2000b. Osteology, paleobiology, and relationships of the sauropod dinosaurSauroposeidon. Acta Palaeontologica Polonica 45(4): 343-388. Speaking of tips for those who don’t have the years of experience that you do, I was wondering, in the course of your career, have you ever gotten tired of studying sauropods? Not to say that sauropods aren’t interesting, or that you might be losing interest in them, but have you ever looked out the window one day and gone “you know, I’m sick of working on sauropods for a while, I’d like to do some research on (say) stegosaur necks”. I ask this question because many prospective paleontologist nowadays, particularly graduate and undergraduate students, are feeling increasingly pressured towards being pigeonholed in a certain, rather small area of paleontology, e.g., tooth wear in extinct ungulates, histology in dinosaurs or therapsids, or ankle adaptations in Triassic archosaurs. In particular, many students end up working on whatever the professor they are working under gives to them as a project, and come out feeling they are so specialized in this area that they can’t work on anything else even if they wanted to. Though, in your case because sauropods exhibit such weird and diverse neck anatomy, it may not be a problem. In my case, I have been doing work on a group that is very morphologically stereotyped, and while I enjoy doing work on it, it would be nice to branch out into more diverse groups given my interesting in things like functional morphology and paleoecology. I know several other people in my research group feel the same. That’s a fantastic question, which deserves a post of its own. Look for it shortly here. « How is it possible that Elsevier are still charging for copies of open-access articles?